Doubleday Canada has landed what will sure to be one of the top selling hockey book of 2008. DON CHERRY'S HOCKEY STORIES AND STUFF, written with veteran sports journalist Al Strachan, will arrive in bookstores across Canada in late October, 2008. This will be Cherry's second book release, with his autobiography penned a lifetime ago in 1983. This follow up book is very much long-awaited. "This is the book that Canadian hockey fans have been waiting for," says Maya Mavjee, Publisher of Doubleday Canada. 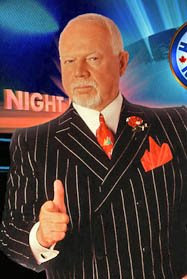 "Everybody here is thrilled to be working with Don Cherry on this book." "Like any good Canadian, I've spent more Saturday nights with Don Cherry than I can count," says Martha Kanya-Forstner, editorial director of Doubleday Canada. "All the stories he has to tell are entertaining, and many of them are unexpected. Don's excitement at the prospect of sharing them with readers is infectious." Cherry needs no introduction. The minor league player turned major league coach turned television character and Canadian icon is more recognizable than most Canadian Prime Ministers. His new book will give his legions of fans the opportunity to share his favourite stories from his incredible career in hockey.